This is not really a step, but I think it’s important. I wanted to review (very quickly) proper soldering technique. It’s fairly simple, but important to remember. Place your component through the hole. 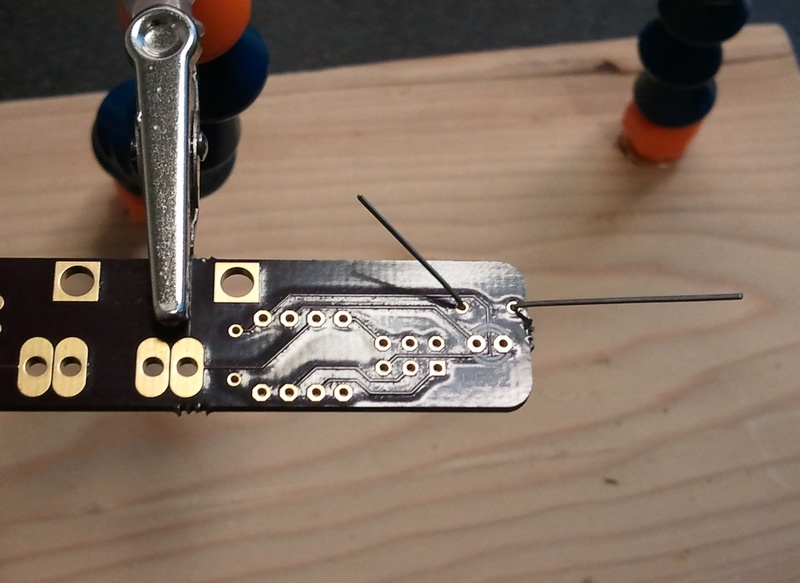 Put the tip of your soldering iron on the pad you’re going to solder to. Leave the tip there for a moment – usually about a second. Watch as the solder magically flows around your component. What you want to do is melt and flow your solder with the pad, not the tip of your iron. You want to make a good solder joint. First, we’re going to place the resistors. These are 220 ohm resistors. The footprint on the board was actually meant for a 1/6 watt resistor, and not a 1/4 watt. Nevertheless, we press forward. 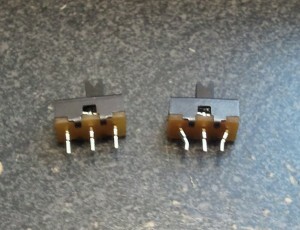 The easiest way was to approach these as though they were vertical standing resistor. Bend one leg down so it points the same direction as the other. Slide it through the resistor holes, and bend the legs out on the other side. Resistors are not polarized, so it doesn’t matter which direction it goes in. 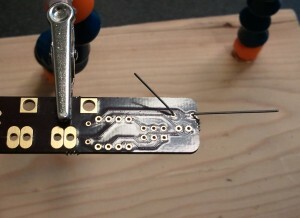 With your resistor secure, flip the board over and solder the two holes. 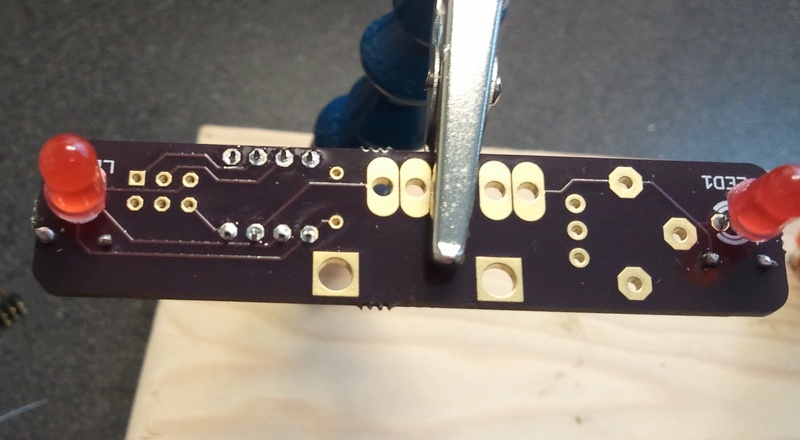 Now that you’ve got one side done, you want to insert and solder the other side. 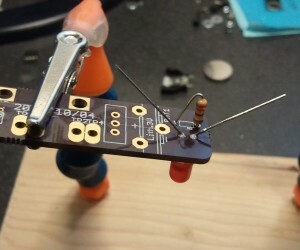 Follow the same steps in bending, placing and soldering the second resistor. You’ll probably want to use a pair of dykes to cut the legs off. If you don’t have a pair, get some, but if you don’t have time to get a pair right now, you can probably use wire cutters or a pair of pliers. Just be careful as you cut. 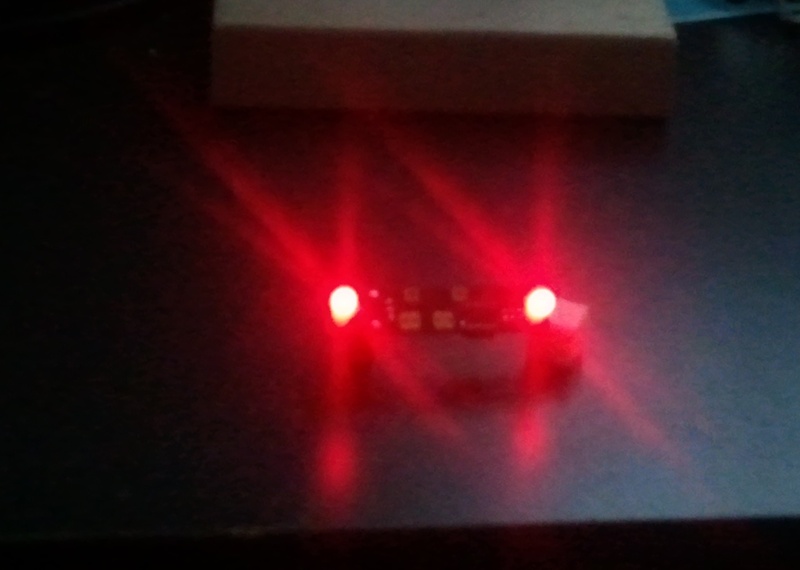 The LEDs, are fairly easy to solder into place, and require less fanangling than the resistors. 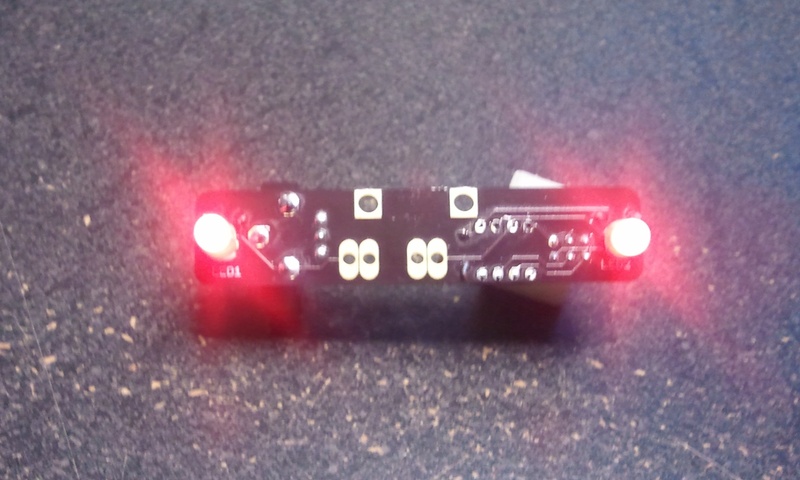 The LEDs are the only components placed on the back side of the board. This is so when you put EerieEyes up somewhere, it doesn’t show off all it’s components everytime the lights are on. Important: LEDs are polarized, they can only go in a certain way. I should amend that by saying “They only work if you put them in the correct way.” The long leg, or the Anode is the positive side, and goes into the hole marked with a plus (+). 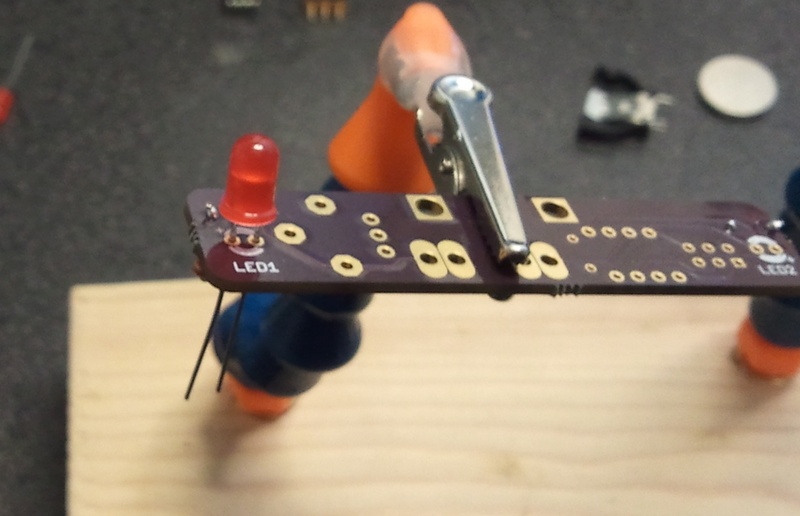 Place the LED into the holes with the longer leg going into the hole marked with a plus (+). 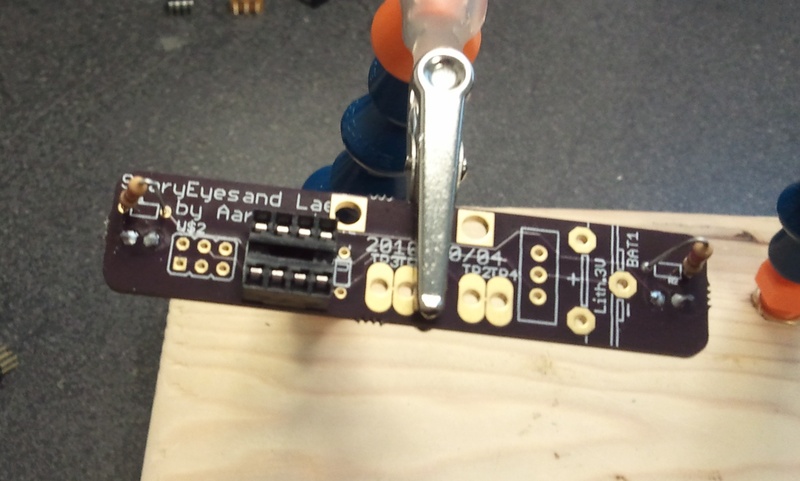 Bend the legs out to secure the LED on the board. 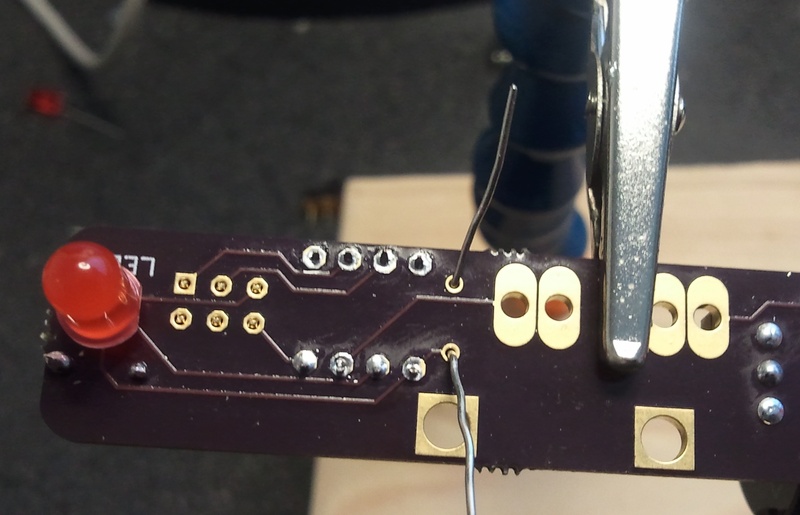 Heat up the pad, and apply solder. Repeat the process for your second LED. Next on the list is the 8-pin DIP socket. We don’t really need this, but it’s nice to have. 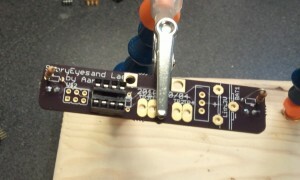 We could solder the chip directly to the board, but this socket allows us to upgrade or swap out a chip for any reason. Also, this board can act as a quick ISP->8-pin chip for AVRs, so it’s useful in that respect. Case-in-point, if you got one of the first 10 or so EerieEyes kits, your chip was programmed on an EerieEyes board. You’ll want to put facing in the same direction as the pin 1 marker on the board. This will help you remember which way to put your chip in if you ever take it out. Push the socket through the holes (you may need to bend the pins in a little), and flip the board over. In my experience, the socket stays no problem, but you may need to push the pins a little to get them to stay. Apply the solder and you’re set. No need to clip the leads here, they’re too short. Yeah, no clever title this time. Unfortunately, the footprint we had for this part was wrong, so we got a switch that didn’t fit too well. Never fear! Pliers will save us! In this picture, on the left you can see an original switch, and on the right a switch where the pins have been bent to fit the board. I found that bending the two outside pins in to about 45 degrees, and then bending their tips down straight worked the best. The switch is not polarized and can go in either way. Once you have the pins set, push the switch in, and solder on the other side. This one is super simple. The battery case slides in only one way. Push, solder, and you’re good! At this point, you’re actually good to go with the board. 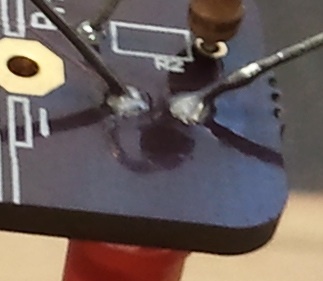 Plug the ATTiny chip that came with your kit into the socket (make sure you’re facing the right direction – chip’s mark matches the indent on the socket.) Plug in a battery, and flip the switch on (this is down, if you are looking at the board). If the board lights up, you did it! Congratulations! If it does not light up, check out the troubleshooting section below. But wait! There’s more stuff in my kit?! Yes, you’re right. In addition to the regular components, there is an additional resistor and a 6-pin header. These allow you to program the chip onboard, or hook up communications, sensors, etc. The header may require a little bit of effort to get in. The pins do fit in the holes, but don’t leave much room for movement. Push in the header, and you may want to provide a little force by pushing the tops of the pins against a table top to get that extra oomph. The resistor should go in just as the first two did. Bend one leg, and mount it like a vertical resistor. 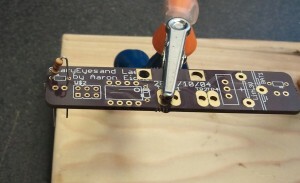 Bend the legs out on the other side of the board, apply solder, and you’re done! If you’re interested in expanding or adapting EerieEyes, here are the Eagle files and the firmware code all wrapped into one convenient package! Is the battery in backwards? The positive side faces the chip, and touches the metal clip. Is the chip in backwards? The orientation mark should be closer to the battery. Do you have good solder connections on everything? A poor connection may actually be no connection at all.